One of the most notorious delinquents of Cromartie. Though he is a robot, no one but the main characters seems to notice, including himself. Other delinquents rely on him and he gives good advice. "Why are you bringing ME your electronics? I want to help you guys in any way I can -- even if I gotta put my life on the line! But when it comes to MACHINES, I'm helpless myself." People seem to find this robot deliquent a bit unbelievable; however, both male and female readers are enamored of Mechazawa for his cerebral and down-to-earth remarks. 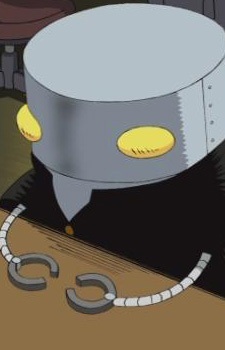 But whatever way you look at it, Mechazawa is a robot - though he obnoxiously tries to play himself of as a human.